At a cryptically-named new company, they’ve spent years designing a new way to work. Here’s what they came up with. Just off the beaten path, about a block west of Fountain Square, sits the newest addition to downtown Cincinnati’s skyline. At first glance it’s an unassuming union—a shadow, almost—of charcoal gray concrete board and glass. Irregular-shaped windows, louvered panels, and mesh screens punctuate the building’s facade, openings that some say make this building look like a giant zipper. Great zigzagging swaths of glass meander down from its roof, too, quietly indicating points of entry guarded by massive concrete pillars, a small hint at what visitors will find inside. Still, the glass has a way of softening an exterior that could otherwise be construed as heavy, even cold. In fact, this building’s windows reflect their surroundings so clearly—Macy’s, Saks, a cloudless blue sky beyond—that it’s hard in some places to see where the structure ends and the rest of the city’s skyline begins. The “canyon” is a five-story stairway topped by a glass roof. Even the mobiles are meant to motivate workers. The building stretches a full block northward from the corner of Fifth and Race, but it exists neither to impose itself on the city nor to blend with its surroundings. It’s here, quite simply, to work. This is, after all, the new home of consumer research giant 84.51°, a space at once both simple and complex, a carefully orchestrated piece of architectural and interior design. 84.51° execs will tell anyone who asks that they paid a whole lot more attention to the structure’s interiors than they did to the outside. Maybe that’s why, on the day 100 West Fifth Street officially opens for business, some 24 months after it broke ground, it’s overflowing with people all itching for a peek inside. Cincinnati Mayor John Cranley spoke for a lot of those at the building’s ribbon-cutting when he joked, “I don’t understand what you guys do.” An air of mystery surrounded the whole project: It’s there in the cypher-like company name, and in the gossip that circulated as the building went up. Rumors floated in the media that nobody who works in this new building will have a desk phone anymore. That there aren’t even any desks. No walled offices, either, and not one single solitary cubicle. Rumors that even the CEO sits at a plain old table, out in the open, just like everybody else. What Cincinnatians don’t know yet is that the rumors are true. What they also don’t know is that this office building is, in fact, the future. 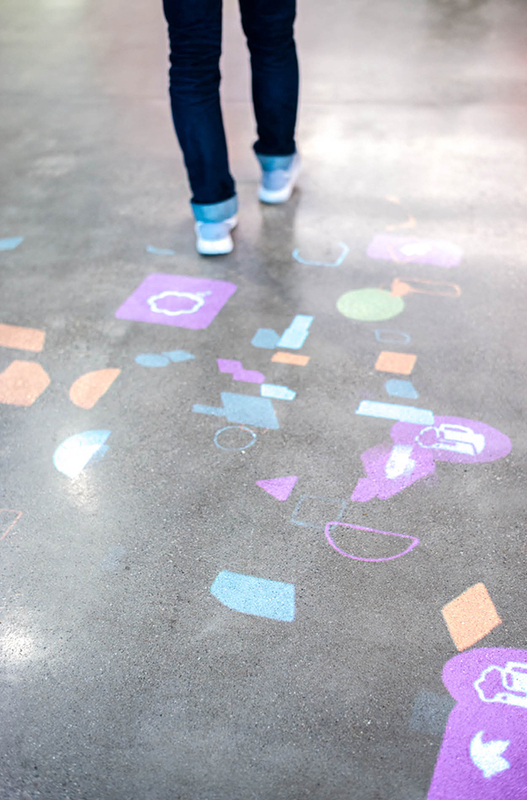 Ten steps into the building, graphic images start appearing at your feet—Facebook icons, text bubbles, pictures of food and coupons, and various colorful shapes. Projected from the ceiling, this “digital dust” is 84.51°’s own concoction—a representation of a generic consumer’s digital footprint that, like the real life stuff it’s meant to represent, follows you everywhere you go. Digital dust, as the company calls it, is also what 84.51° lives on. What brand of toilet paper do you use? Why do you buy generic yogurt but name brand eggs? Do you click on ads you see on Facebook? Do you prefer online coupons or paper? 84.51°—on behalf of Kroger (its biggest client, and since late April, now 84.51°’s owner, too)—cares about these things, and wants to know the answers. The answers, which can be found in mountains of customer data, obtained with simple things like Kroger Plus Cards, are crucial in studying shoppers’ behaviors, anticipating their needs, and pleasing today’s ever-changing customer base. So when the company, which started in 2003 as a one-man offshoot of British parent dunnhumby Limited, grew to 310 employees by 2009 with no signs of stopping, they knew they needed a new home. 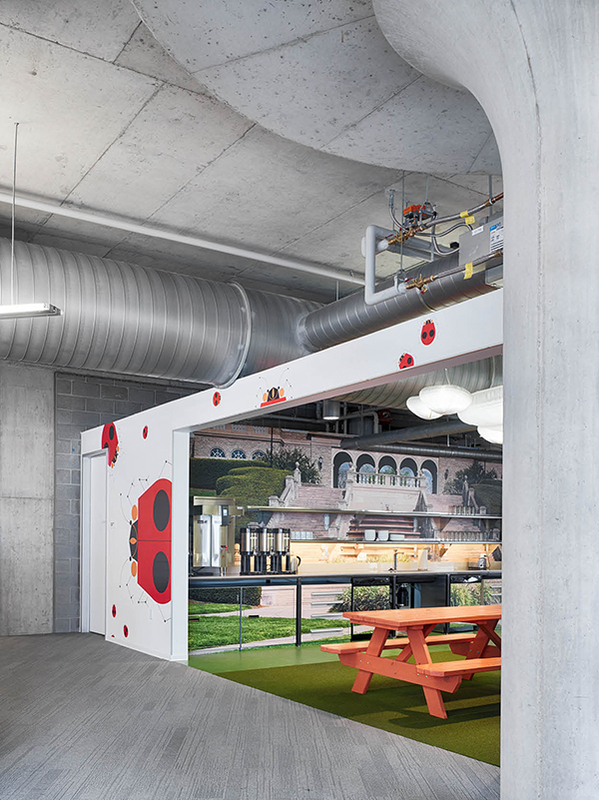 They also knew they needed to work with Gensler—a San Francisco–based architecture firm that focuses on “client research-based design,” says Design Director/Design Principal Todd Heiser. Gensler can sometimes spend years working with clients, thinking about the ways in which they use their office spaces now and in the future, before they engage in the actual design process. That environment, they decided, was a place with no walls and no cubicles, no matter what a person’s title was. 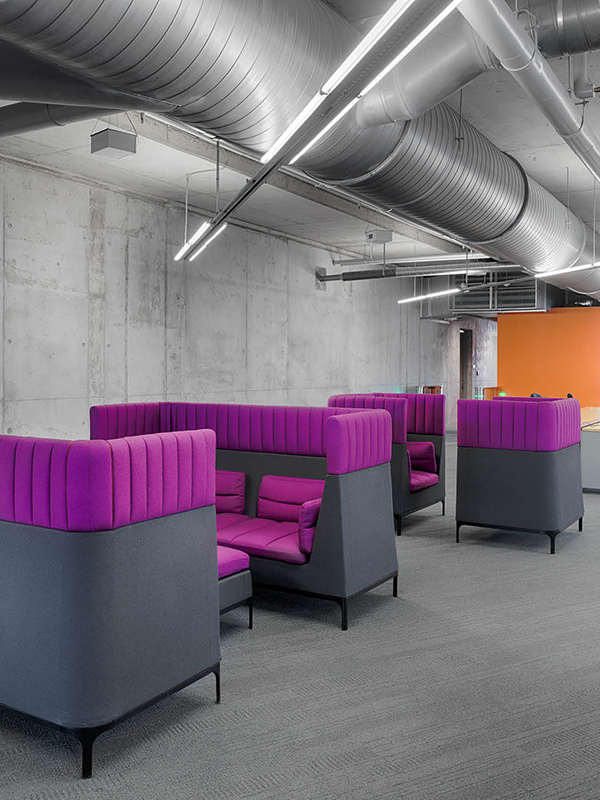 A place where collaboration was king, and where employees were valuable assets encouraged to think as freely and creatively as possible, and to feel as comfortable approaching top management as they are approaching their peers. In short, 84.51° decided to construct an entirely open office building. Today, cubicles have morphed into “desking or benching systems,” says Stegmeier, and open offices are solidly gaining popularity. There are sizable examples already here in Greater Cincinnati—Total Quality Logistics has a 100,000-square-foot open office in Clermont County, and Paycor opened its 136,000-square-foot open office in Norwood last year. Big international firms like Google and Facebook have helped introduce the concept to Americans, too, thanks to media coverage of amenities like lap pools, indoor tube slides, and roof gardens with places to nap. For the record, Palm says, “There’s a fine line between a playground and a very modern office space that facilitates creativity. We’re not going to the Google side.” In other words, more work, less play. 84.51° started experimenting with open plans in their previous building, an old post office at 444 West Third Street. First, things like walls and cubicles were replaced with long, table-like desks. When the office got a little too loud, they started piping in white noise—“background noise,” says Chris Richter, the company’s facilities manager—to even things out. (Otherwise, the volume in an open office quickly grows to a distracting dull roar and “next thing you know I can hear the conversation somebody’s having on the phone two rows over clear as day,” Richter notes.) Employees who needed blocks of quiet time were encouraged to move for an hour or a day—however long they needed—to designated meeting rooms and privacy booths. Soon, cool new pieces of furniture were brought in to try out, too: standing desks, treadmill desks, even high-back upholstered couches that provide comfortable and open—but semi-sound-proof—places to hold informal meetings or work quietly. On one visit to the work-in-progress, construction workers were all over the 84.51° building like ants at a picnic. Palm had warned not to brush up against freshly painted metal railings even as, a few feet away, steelworkers were still fusing other parts of the same railing together with blowtorches. Dodging errant sparks, we toured the building, noting that—even amid the construction—some things were already done: the few walls (mostly for meeting rooms) had been painted, the floors covered in shades-of-gray angle-patterned carpet. Workers had recently finished assembling dozens of hanging mobile-like sculptures that on first glance are covered in more digital dust symbols, but when viewed from the right angle align to spell out the words LOYALTY and CUSTOMER FIRST. 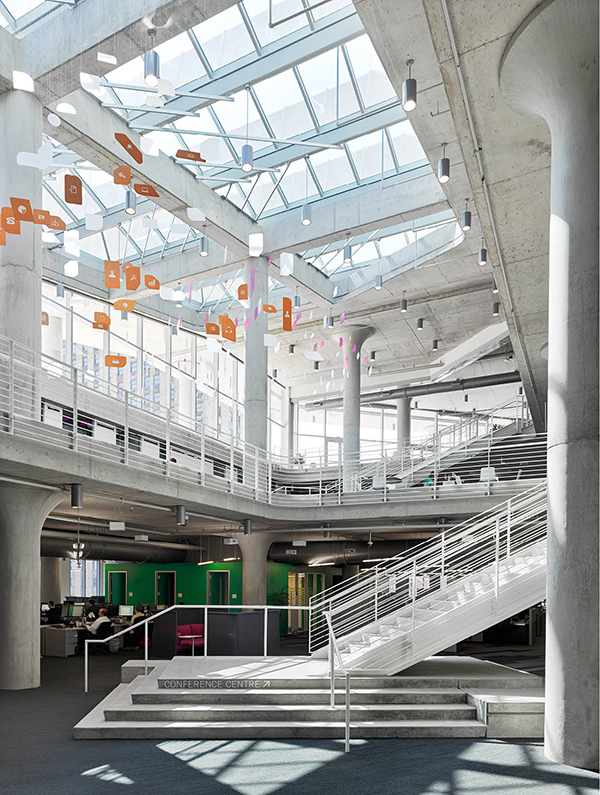 These pieces are suspended from the top of the “canyon”—a cavernous five-story stairwell in the center of the building with an expansive glass and steel-beamed roof overhead. One of the keys to making such a vast, wall-less space work is dividing it in other ways. 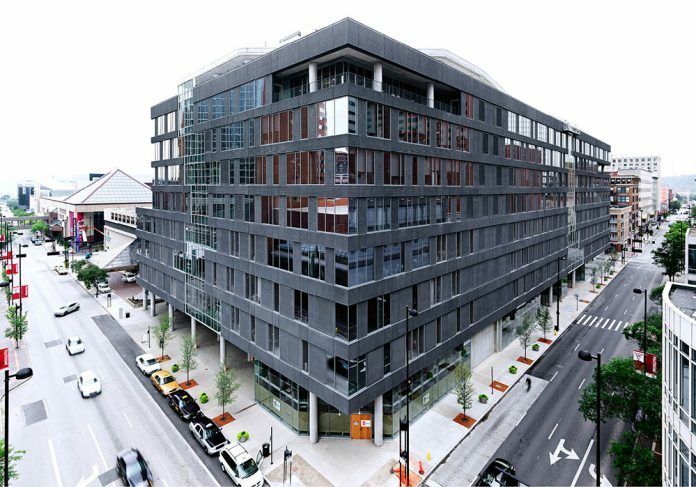 Gensler and 84.51°—whose offices span floors five through nine (one through four consist of commercial space and a parking garage)—selected different paint colors for different parts of the building, to “allow for way-finding,” says Heiser. But the architect’s main suggestion was to portion the building into three types of areas: neighborhoods, localities, and piazzas. A neighborhood is basically an island of work tables clustered near each other. A group of neighborhoods is called a locality, and includes shared spaces like meeting and break rooms. Piazzas are “communal spaces” of various sizes that are sprinkled throughout the building, where employees can host clients, sit in on training sessions, or gather in large groups (the bulk of the eighth floor is one such space). Old-fashioned hallways as we know them are virtually non-existent; the idea of straight lines of traffic have been dissolved. 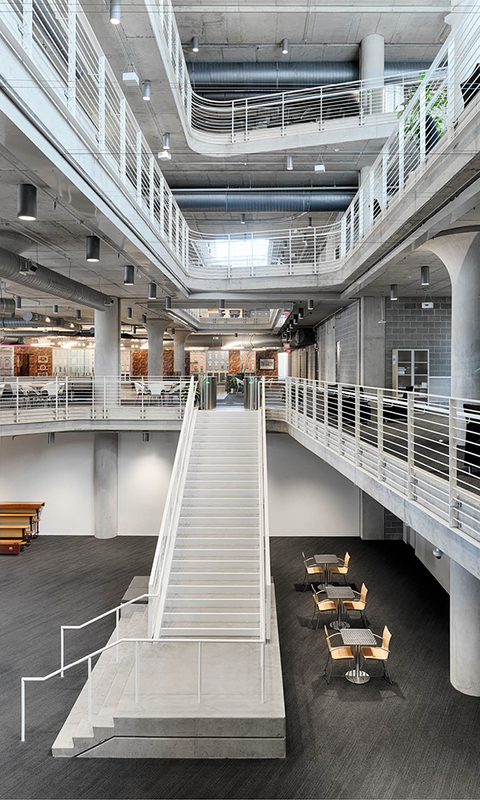 Then again, Gensler’s very specific ways of dividing the space ensure that the building feels nothing like a giant warehouse, either. The meeting and break room walls are especially helpful in loosely dividing the space and creating some contour to the interior design. Technology, especially in the way it makes paper unnecessary, has played a huge role in the rising popularity of open offices. With most file storage existing primarily digitally today (instead of in big bulky file cabinets), companies have significantly more space for things like break rooms and flexible seating. The real key to making an open office work, though, is having enough private spaces where people can go for “heads-down,” focused work when needed, says Palm. According to Stegmeier, a common complaint clients have after converting to an open office is that they didn’t allot enough space for such rooms upfront. 84.51° execs learned this pretty quickly while experimenting with the concept in their previous building. By the time they moved out, “literally people were fighting for meeting space,” says Richter. The number of meeting rooms has more than doubled in this new space and now numbers close to 200. They vary hugely in size from one-person privacy booths to a divisible, 300-person theater-style meeting space. When asked if anyone has ever moved into a privacy booth and refused to come out, Palm laughs, noting that the company’s turnover rates with analysts—typically a highly introverted population—is quite low. The key, he explains, is that “you have to have the right mix of space types in order to accommodate” different people with different work styles at different times throughout the day. It is kind of puzzling to think about a CEO sitting right out in the open, handling confidential company business in front of anyone who happens to sit—or walk—by. And, of course, corporate necessities like annual reviews require private rooms, too. What’s Stegmeier’s take on the new normal? “Once a year in December you can have eight meetings,” in a meeting room; the rest of the time, you’re probably fine sitting out next to everyone else. Even if you are the Big Cheese. For instance, you might not think it’d be quiet sitting in one of 84.51°’s fuchsia, high-back upholstered benches facing an identical bench set mere feet away. Tall-backed chairs double as intimate conference spaces. But these two pieces of furniture have been engineered to reduce sound when facing each other just like this, and somehow, they really do. Inside, voices become muted and you feel a definite sense that you are removed from the hubbub of the rest of the office. In a mini conference room, of sorts. And second: Is catering to a younger audience a sound business principle? In a recent Wall Street Journal article, Lindsey Gellman noted that “millennials—those roughly 18 to 34 years old—make up the largest share of the U.S. workforce.” Gellman also noted, though, that “last year, the median job tenure for workers aged 20 to 24 was shorter than 16 months. For those aged 25 to 34, it was three years.” An open office is a major investment for a group of people who’ll potentially be leaving your company any time between now and 2018. Once you understand what an open office is, you can begin to understand why Gensler and 84.51° designed the building the way they did. It’s not a stretch when Todd Heiser describes this place as “bespoke.” As in: Custom tailored. Fitted like a very fine suit. Here, people work on teams, and client leaders work hand-in-hand with analysts sharing data and pertinent information on various projects throughout the day. Company spokesperson Ann Keeling offers this example: “Team members work with clients to determine offers that will benefit specific customers. Other members write copy, develop the design and layout, identify the best customers that will benefit from the offer, [and] ensure coupons are coded correctly and are set to scan correctly in your local Kroger store.” The kind of work 84.51° does “takes a variety of experts,” she says, all working together at once. The centerpiece of the building’s interior is definitively that giant, glass-topped open staircase affectionately known as The Canyon. It floods all five floors of 84.51°’s space with natural light and provides views of the downtown skyline, too. (Jacobson, the building’s main architect, notes that employees working on the lowest level—the fifth floor—can see Carew Tower through the ninth floor skylight.) But at 84.51° there is an ulterior motive to letting it shine throughout as well. “We decided, through the architecture, we would use light to force people to move through the building and interact with their colleagues,” says Heiser. In other words, they’re hoping most employees will opt to take the stairs instead of the elevators (which consume energy and contribute nothing to personal fitness and employee connectivity—a biggie in a collaborative office environment). As at the street-level entry, the most visible material feature of the entire building—which boasts the largest floor plates in downtown at 70,000 square feet per floor, according to the folks at Gensler—is unfinished concrete. In fact, the nearly 1,000 martini glass–shaped concrete pillars that dot the building’s floorplan (a definite nod to Frank Lloyd Wright’s lily pad columns at the S.C. Johnson headquarters) seem to be the architect’s one aesthetic indulgence not tied to the open office agenda. Granted, they do serve a higher purpose—holding up the building. 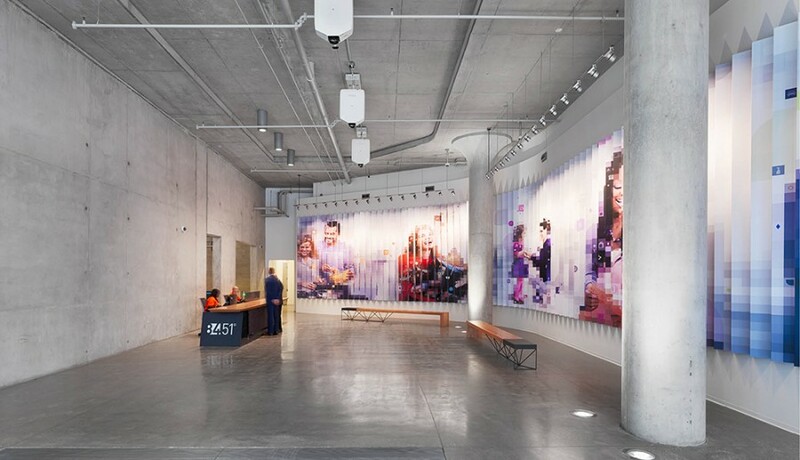 The street-level lobby and louvered wall graphics visualize 84.51°’s mission. When Kroger took hold of the company’s reins this past spring, some people wondered if 84.51° would really stay a 100 percent open office. After all, Kroger’s corporate headquarters in that nondescript gray rectangular building just north on Vine Street are pretty much the antithesis of 84.51°’s—basic, traditional, cube-infested, and most definitely walled. Kroger execs remain silent on whether they’ll make changes (they declined to be interviewed for this story), but so far not one single wall, all of which are painted in dunnhumby’s signature colors—pumpkin, sage, teal, and fuchsia—has been added or touched. Given that Kroger has always owned 50 percent of the company anyway, and that, per Palm, “a very large percentage” of dunnhumbyUSA’s Cincinnati office was always focused solely on Kroger to begin with, the future of 84.51°’s open office seems stable for now. Truth be told, Kroger’s purchase of 84.51° feels to insiders a little bit like consummating a marriage. After all, Palm says his security badge has always worked in Kroger’s corporate offices, and Kroger employees have always been allowed to use dunnhumby’s fitness center at will. And Kroger Personal Finance has, from day one, been slated to move into the building’s fifth floor (where they’ve designed their portion of the building to include walled offices). The rest of the structure, meantime, is working hard at fitting in downtown. 3CDC manages its public parking garage (which is owned by the city), but it also owns all of the building’s first floor commercial space, which has been subdivided into five usable storefronts. All are currently vacant, but Anastasia Mileham, 3CDC’s communications czar, says they’re “currently mostly negotiating with food service establishments” for these spaces. Takers include Joe Lanni, cofounder of Thunderdome Restaurant Group (creators of Bakersfield and The Eagle); Cristian Pietoso, chef and owner of Via Vite, who plans to expand his horizons by opening a “burger joint”; and Jose Salazar, who is working on a Latin-cuisine restaurant called Mita’s. As the elevators transition you down from the urban-tree-house-style ninth floor lobby, through the high-tech security bays and back into the building’s street-level foyer, polished concrete floors and those little projections of digital dust dancing at your feet are the only remnants of the bright, open, and—dare we say it?—“happy” place that exists upstairs. Walking back out onto Fifth Street—beige sidewalks blending into building after building, and people walking hurriedly by, heads down—is kind of jarring after a few hours at 84.51°. A little less planned, a little less fitted, a little less certain than the place you’d found inside.